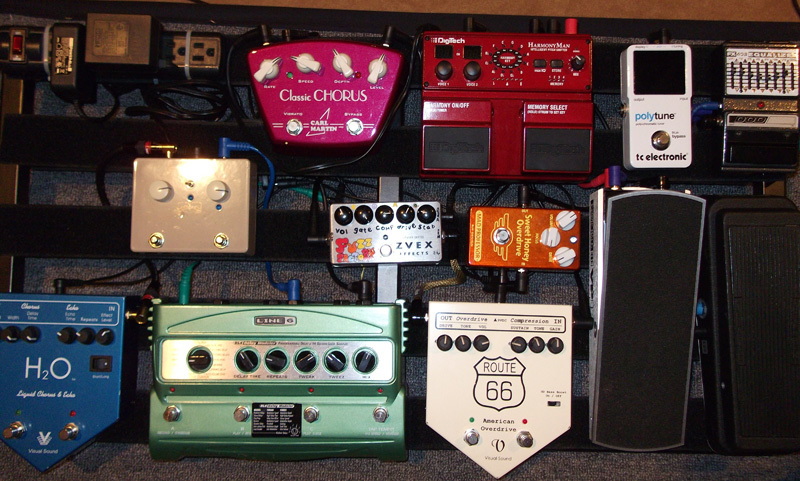 Today’s pedal line is from Justin Wright. If you have a pedal line (doesn’t have to be in a board) for your rig, please email me a photo, bio, description of pedals and routing to pedalline@nulleffectsbay.com. Every Friday I’ll showcase a pedal line submission. Make sure you include any links to your band or music page. My name is Justin Wright. I hope you’ll accept my submission. * DOD EQ * – I use this at the front end, mainly to scoop some mids and give me some line boost because of the long chain. * Ernie Ball VP Jr. * – Great for swells and just muting the chain. * TC Electronic PolyTune * (Fed from the “tuner” out on the VP Jr.)-Great tuner, lets you tune one note at a time or strum all six and see anything flat or sharp. * Digitech Harmony Man Intelligent Pitch Shifter * – This pedal is just fun, makes tons of usable sounds from harmonies to normal octave up and down. Has to be near the front as it requires a clean signal. * Visual Sound Route66 * – Another one of my original pedals. Combination Compressor (based on the Ross and the MXR Dyna Comp) and a Overdrive that’s a TS-808 clone with a bass boost, which I keep on. One of these effects is usually on at all times. * ZVex Vexter Series Fuzz Factory * – I honestly don’t use this much, but it’s great to bring the noise if you need that. * Carl Martin Classic Chorus * – This pedal has a great chorus and a switchable vibrato sound. I use both sounds some. The great part about this one is that it has a great gain circuit that gives lets me dial in that “tubes are just about to break up sound” with ease. * Lovepedal Les Lius * – This one is supposed to sound like a Fender Tweed amp set to explode. Not so sure about that. To me this is the Keith Richards box. It just sounds like the Stones to me. * Line6 DL4 Delay Modeler * – This is not the best sounding, most nuanced delay out there, but for ease of live use, versatility and cost it’s a winner for me. Also, it’s built like a tank. * Visual Sound H20 Liquid Chorus * – Love this one, much less subtle of a chorus that the Carl Martin one plus it also has a great analog sounding delay that I’m currently using as an echo. * Godlyke Power Supply + Visual Sound 1Spot Supply * – I’m using bits and pieces of both of these systems, but I find Visual Sound to be superior in all cases.